Hi IBC. I have a Scotts Pine and a Mugo pine, and i wondering what techniques to use on the development of both? Candle pinching, bud pinching and needle thinning. I have read Bonsai Today's book of Black Pines and White Pines. However i can not find any information anywhere about the techniques to use on my Scotts and Mugo. Will it be the same Techniques as a White or Black pine or have they got there own way of training? Any information would be more than helpful. Thanks for the help that you can give me. Pinus sylvestris is Scots pine, named after that country to the north of you. It has nothing to do with anyone named Scott. The US Forest Service (and the Christmas tree growers) call it Scotch pine. Although they are otherwise tolerant of our language differences, somehow the British get very upset over this (at least the ones I've met). Hi. I am sorry i should have said pinus sylvestris. I no this information already but thank you very much anyway. Julian Adams wrote a couple of articles on Scots pine in International Bonsai a couple of years ago. I have also traded additional information with him. 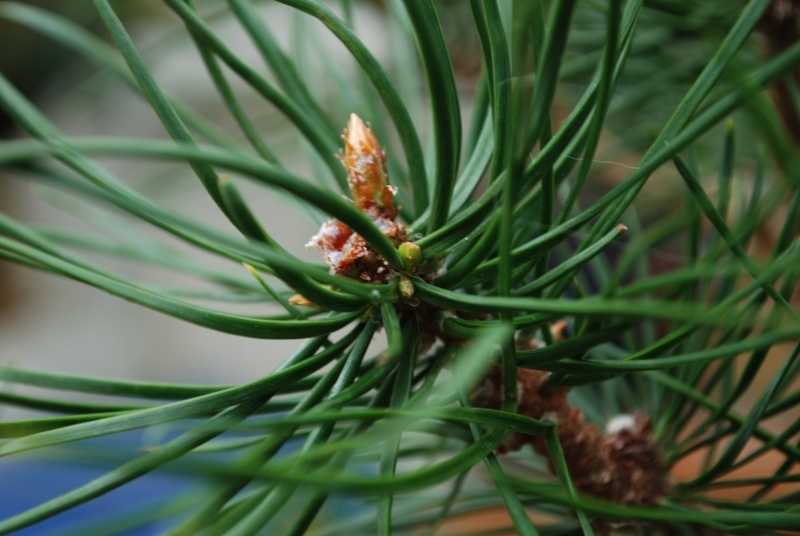 Scot's pine is not as strong as black pine and seems to decline if the shoot are cut, particularly if not given a year or two rest between efforts. However, it back buds strongly and responds very well to needle thinning and candle pinching to regulate the energy. I have observed that there is an over strong response when the shoots are cut - you get 10 to 20 buds at the cut terminal. As a result, the tree does not have enough strength for them to mature and you end up with a knob of short ugly, twisted shoots that will not develop next year when they try to grow out later in the summer. This year I have been thinning those to 2 or in some cases 3 buds and it seems like I am getting better development of new shoots. However, I won't know for sure until fall or next spring. 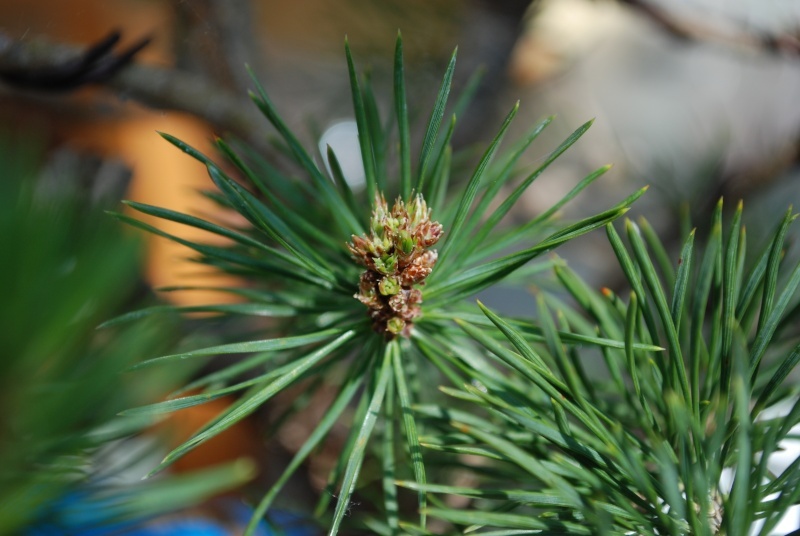 Hans Van Meer has an excellent article for 2 needle pine care on his website. It's well worth checking out. The "British" probably wouldn't be overly bothered, given that a significant number of them wouldn't understand that there was a difference or indeed would know that Scotland has only one "t" in it. The Scots, on the other hand, do get a tad heated over it, but I would take the sideswipe at my countrymen and say that in many cases this is more for misplaced nationalistic reasons than for linguistic ones. Although a perfectly acceptable term a hundred years ago, "Scotch" it is now widely used to refer to the drink - though most Scots would called it whisky before they called it Scotch. The preferred term for us natives of Scotland is Scots (n) and the language used in certain areas of Scotland (historically and occasionally still) is also Scots (n). But in fact the term Scots Pine is a bit of an anomaly, and if we took the American line that it is an adjective, then technically we should refer to it as the Scottish (adj) Pine. Absolutely none of which answers poor Mikey's question Mikey, I think there is also some good info on bonsai4me and if you are really keen then do feel free to come up here and I'll introduce you to my bonsai friend Ian who is our resident expert on Scots Pine. And please note I was writing tongue-in-cheek in my language lesson although I do confess to sharing Iris's frustration at incorrect spelling and format of either botanical or common names. They get marks off for that at Chelsea Flower Show I'm told. Darn right too! fiona wrote: The preferred term for us natives of Scotland is Scots (n) and the language used in certain areas of Scotland (historically and occasionally still) is also Scots (n). But in fact the term Scots Pine is a bit of an anomaly, and if we took the American line that it is an adjective, then technically we should refer to it as the Scottish (adj) Pine. Not necessarily. It is true that in botanical Latin, the species epithet is usually either an adjective or a possessive. However, if you look carefully at many common names in English, they are not so much a noun following an adjective, but rather the construct state, two linked nouns. Therefore Scots pine is linguistically kosher. scots seem mostly like japanese black pines. in my experience the big ones sulk when they are repotted. about 9 months. also they eat a lot in sterile substrate. i use biozorb. ive still not got the feedign perfect. big hits of fertiliser every 10 days didnt work for me. i give normal strength every 2 days. i use canna tera vega for now. with some fish emulsion every few weeks. my pines are watered daily with rainwater. when they are happy they go crackers and throw out new buds everywhere. even faaar back on deadwood. 5 year old deadwood in my case. here is one of the oddball terminal buds. i had no idea what this was when it happened. never seen anythign like it. they all die. so you will need to thin them out. i thought maybe it was a pinecone. when you cut it back into old needles often every needle turns into a bud. so you need to prepare a landing strip in advace for your pruning. 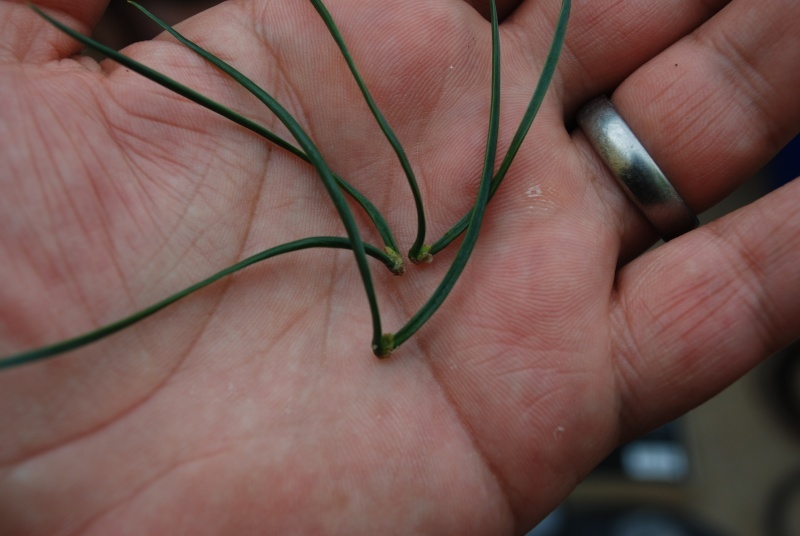 as you can see on this image the needles below the cut are all splittign with new buds. i spent most of today doing buds on a smaller scots pine as ive got candles extened now for a second flush of growth. they are still quite loose and come off very easily. I got a useful book second hand off amazon by colin lewis which had a large section on scots pines. its ok. you will need to scrape together knowledge from wherever you can get it. and there is no substitute for experience. im in london and these live out on my lawn in the back yard in full sun. Thank you very much for all the feed back every one. It is very much appreciated. I will start my note book today hehe. you must mean bare wood ?? dead wood is dead ie no bark, no life, bleached maybe.....bare wood is living with dormant buds under the bark. your scots pine is very similar to a black pine in its care - if you follow the pine book advice but thin out all new terminal buds to 2 or 3 at most it will respond very well. they back bud easily all over (if well fed and are candle pruned), and they often end up too dense so you need to thin inner shoots or even cut longer branches back to inner shoots at times. Mugo i find do not respond to techniques used on black or white pines - they can be very sulky and can loose branches almost at random. there may be growing evidence indicating removing older needles from the shoots will steadily weaken the tree, and a couple of yearrs of needle pulling and a repot can kill a tree quite easily. Within our club, and a neighboring club i visited last month more members had lost mugo pines than any other pine species, usually with the tree going into slow decline. the healthy mugos i see have all their needles left in place until the tree naturally drops them, so you will end up with a bushy denser image rather than the neat tidy look of the japenese pine styles. there is an article online somewhere where a couple of amazing looking yamadori mugos that were refined to the point of being show ready both died on the owner, he concluded it was incorrect repotting time i think - To do well with a mugo i think you need to avoid 'bonsai' techniques that have been perfected on other species and go gently on the tree while accepting it will end up in its own unique style. haha....i avoided 'not' answering any part of your question with an anglo/american discussion on language differences ! "tomarto/tomaato"
Thank you very much for all the replies. It has been some great advice. Marcus I agree and thank you for your reply also. I bought a Mugo from Tony Tickle a few month ago and by mistake i started to needle pluck the tree. It has not budged and the needles that have grown this season are about 1cm long and there have only been about 1cm worth of growth. However there are tiny little buds appearing next to the main buds at the end of each tiny candle I was going to bring this tree to the Burrs event but now i think it would be wise to let the tree rest for the rest of the year. And maybe next year too. Once again thank you all very much for all this great information. Look at the right column down the page named Matsu (which means pine). Apologies. i meant old wood. Late nights. ghastly employers. i had some further thoughts on needle plucking. Ive been watching some of the better known european bonsai people and thier treatment of pines - walter pall was blogging this week about mugo's. I suppose i dont have the experience of generations of bonsai nurserymen to draw upon like the japanese - or 40+ years like some of the more experienced europeans. I see some of them pluck needles on thier mugos right back to the last few needles the ends of the branches. Im still very conservative and dont have this depth of experience to draw on as to how heavily i can pluck back. I still have 3 year old needles on and let most of them drop off when they are ready. i do remove the old ones from the undersides of branches. I also remove needles from excessively vigorous areas to slow them down - every second or third pair. the timing and quantity of needles removed is something worth give consideration. certainly not the same as done on JBP. If in doubt leave them there.